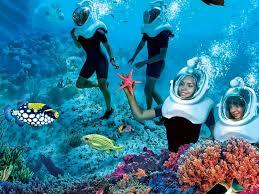 Your search for sea walking in the Andaman Islands comes to an end at Make My Trip Andaman. We are located in Port Blair (Andaman & Nicobar Islands) and assist clients in relishing the venture of sea walking in the Andaman Islands. Clients approach us for enjoying this activity throughout the year. There are different locations in the Andaman Islands where you can not only enjoy sea walking, but feed the fish as well. Many people who have utilized this service of ours have appreciated the efforts of our professionals.